Jodhpur, India — Thousands of pilgrims panicked by false rumors of a bomb stampeded at a Hindu temple in western India on Tuesday, killing at least 168 people in the crush to escape, officials said. More than 12,000 people gathered at the temple at dawn to celebrate a Hindu festival in the historic city of Jodhpur when the stampede occurred early Tuesday morning. The temple floors were slick with coconut milk as thousands of devotees broke coconuts as religious offerings, causing pilgrims to slip and fall as they scrambled to escape, said Ramesh Vyas, a pilgrim who was standing in line. Vyas said it was the false rumors of a bomb that sparked the chaos, and that tensions were high because India has been hit by a spate of recent bomb attacks. The latest was on Monday night in the western city of Malegaon, killing six people and wounding 45. 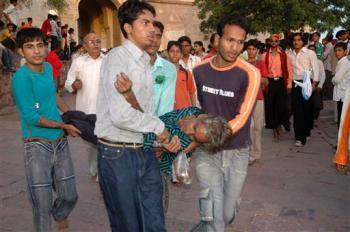 At least 168 people were killed in the stampede, said Naresh Pal Gangwar, the district collector. Television footage from Jodhpur showed dozens of bodies lying on the sidewalk, while nearby frantic people tried to revive unconscious devotees, slapping their faces and pressing on their chests. The injured have been admitted to half a dozen hospitals in Jodhpur. Tuesday marked the first day of Navratra, a nine-day Hindu festival to honor the Mother Goddess. Jodhpur is some 180 miles (290 kilometers) southwest of the Rajasthan state capital of Jaipur. Deadly stampedes are a relatively common occurrence at temples in India, where large crowds — sometimes hundreds of thousands of people — congregate in small areas lacking facilities to control big gatherings.